“Best wedding ever! Best music ever!” That’s directly from the mouths of this lucky couple, having a blast at Benvenuto Restaurant in Boynton Beach. Ask for DJ Adonis when you book. We caught our Mitzvah Crew in a candid moment! From left to right: Sandy Levine (aka DJ Sandy), our candid snap-shooter, Dancer Gladys G-Sparx, MC Wes, and DJ Buddy. Photo taken at the Pavilion Grille, Boca Raton. Check out these chair-tastic moments from some of our recent Bar and Bat Mitzvahs! It’s Debbi here. We’ve been getting positive feedback about the new look of our blog but we’d like to know more about what you want to see. Want to share a pic of your big day or an experience with one of our DJs? Do you have a wedding or party tip to share? Contact me at debbi@letspartydjs.com–I’d love to hear from you! 🙂 Full credit will be given for all submissions. Uplighting adds mood and texture to your event–and costs less than you think! We even have LED Uplights that can work with your party’s color scheme. Check out more information here. When 15 of their family and friends like Let’s Party! 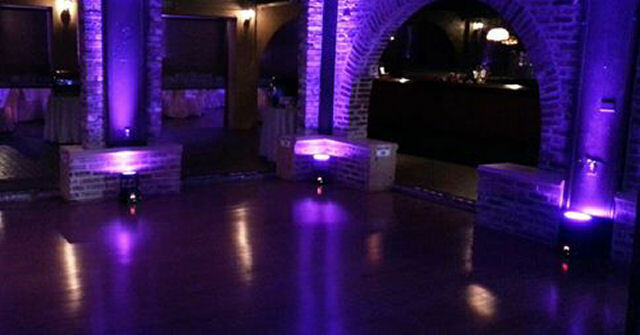 DJs on Facebook Vanessa & Nick will get FREE PARTY LIGHTING – up to a $300 Value!! How about you? Book YOUR next event with Let’s Party and have 15 of YOUR family and friends like Let’s Party! DJs on Facebook–we’ll get you free dance floor lighting too!